Juan Lopez cigars. Buy original cuban Juan Lopez cigars online. Think of us as your best cuban famous cigars shop online on the Web! We offer best Juan Lopez cigars. A very old brand which dates back to the 1876, this famous Cuban cigar has always been only handmade. Its story begun in the 1870's when a Spanish businessman, Juan Lopez Diaz, established this brand. Although not as popular as other Cuban brands from the same category, this brand occupies its own place in the Cuban cigar industry, being considered one of the best among Cuban cigars. The sizes this brand could provide to a smoker are very limited, however, it doesn't stop smokers around the globe ask for its cigars at their local cigar shops and want to smoke them again and again. 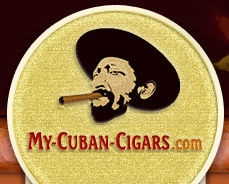 Since if you have tried it once, you would surely want to try more- My-Cuban-Cigars.com guarantee. However, be aware that this cigar is not for everyone, since its flavor range could vary from medium to strong. So if you are a novice in the cigar world, let My-Cuban-Cigars.com help you decide what to choose from. This brand is often released as a regional edition, and has been particularly aimed at such countries as France, United Kingdom, Switzerland, the Caribbean region, Andorra, Asia Pacific, Benelux (i.e. Belgium, the Netherlands and Luxembourg), Germany, Austria and Canada. As you have probably noticed, these cigars are in high demand, and don't have a lot of vitolas in the regular line production. The regular cigars from Juan Lopez are the following: Selection No. 1, Selection No. 2, Coronas, Panetelas Superba, Patricias, Petit Coronas. Unfortunately, some of them have been currently discontinued, though the entire Cuban cigars smoking world is waiting for them to appear again, or, at least, release some new regular line cigars.